"E" Series Toggle Clamp - The original "E" Series Hydraulic Toggle Clamp has been in the Marketplace since 1992. A tried and true solution, most all of these machines are still in regular service today. Available in Clamping Forces from 60 to 1500 tons. "E-SE" Hybrid Servo Energy Pump Series machines have our upgraded Servo Energy Pump Package instead of a conventional hydraulic system. These systems provide improved response rates versus conventional fixed and variable volume pumps, and lower the energy consumption of the machine into the same range as an "All Electric" machine. "E-SE" Machines cost just slightly more than our tried and true "E" Series. Available in Clamping Forces from 60 to 1000 tons. "E-3" Servo Screw Drive Series machines incorporate a Servo Electric Drive in lieu of a conventional hydraulic Screw Drive. This allows concurrent motion, and permits the continued recovery of the Shot Size with Clamp and Ejection Motion for Part Removal. Available in Clamping Forces from 60 to 1500 tons. "Ex" High Performance Series machines are specified for firms looking to produce products requiring the absolute fastest Cycle Times. This include Preforms, Caps and Closures, and other products requiring high production rates. Available in Clamping Forces from 60 to 500 tons. "H" & "H-SE" Hydraulic Ram Clamp Series offers the same robust features as our "E" & "E-SE" Toggle Clamps. Our "H" & H-SE" Series offer one of the largest Platen Areas for the available tonnage. Available in Clamping Forces from 30 to 180 tons. "K" Series "All Electric" Machines offer the ultimate in performance and application. Standard with up to 300mm/Sec. Injection Speeds, we can also spec out our "K500" Series for Injection Speeds up to 500mm/Sec. Available in Clamping Forces from 30 to 150 tons. 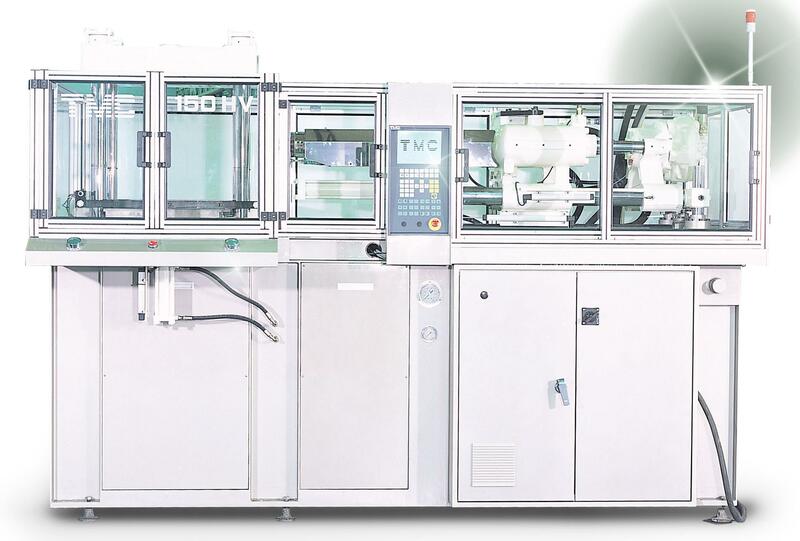 "H/V" Series Insert Molding Machines (shown to the left) are available with either Vertical or Horizontal Injection Units, and can be built for multiple Injection Applications (see Custom Engineered "Turnkeys"). Available in Clamping Forces from 30 to 300 tons. TMC Plastic Tech Group of N.A.